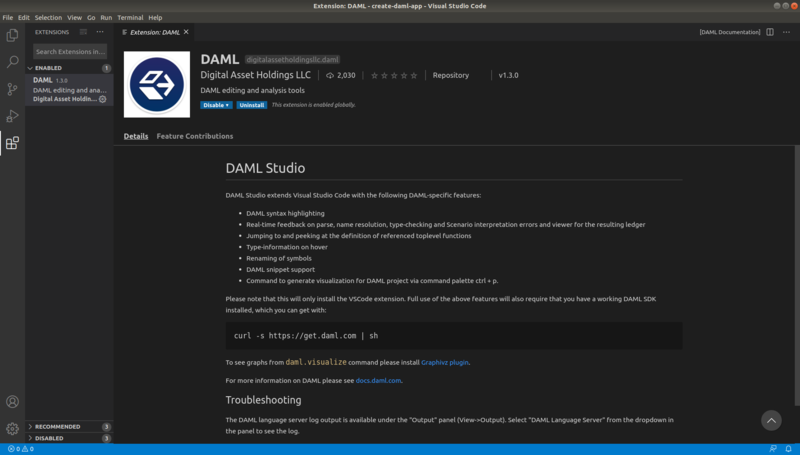 DAML Studio is an integrated development environment (IDE) for DAML. 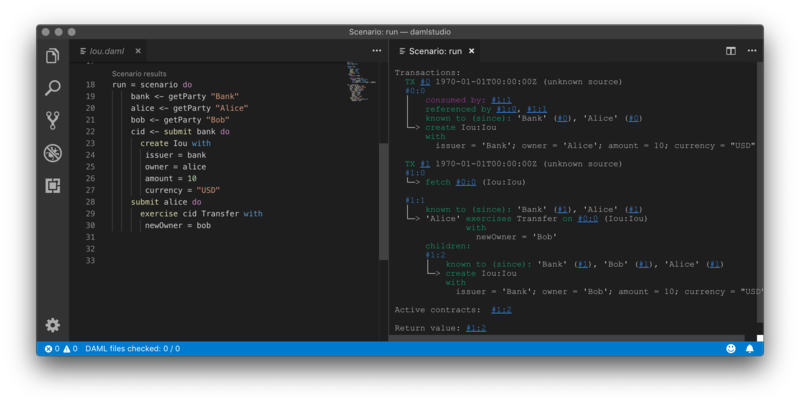 It is built on top of Visual Studio Code (VS Code), a cross-platform, open-source editor providing a rich code editing experience. 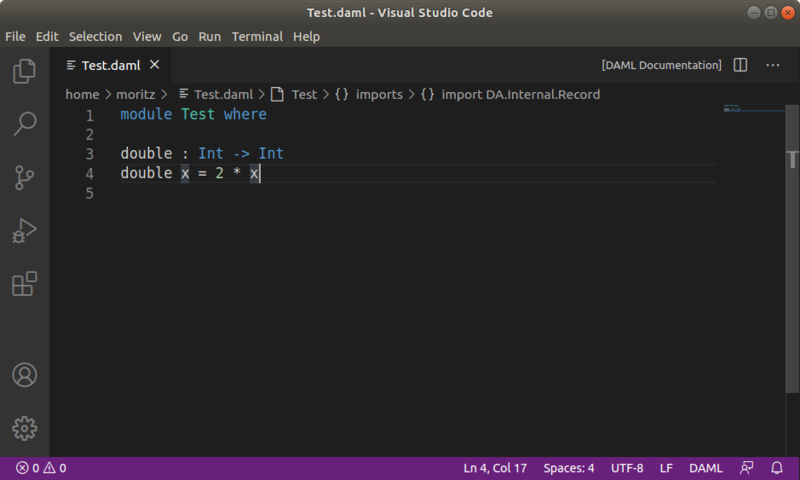 DAML-specific features are provided via the DAML Studio extension for Visual Studio Code. Start Visual Studio Code. To start it in the current project, use the da studio command. Alternatively you can simply start VS Code as you would normally start any application. 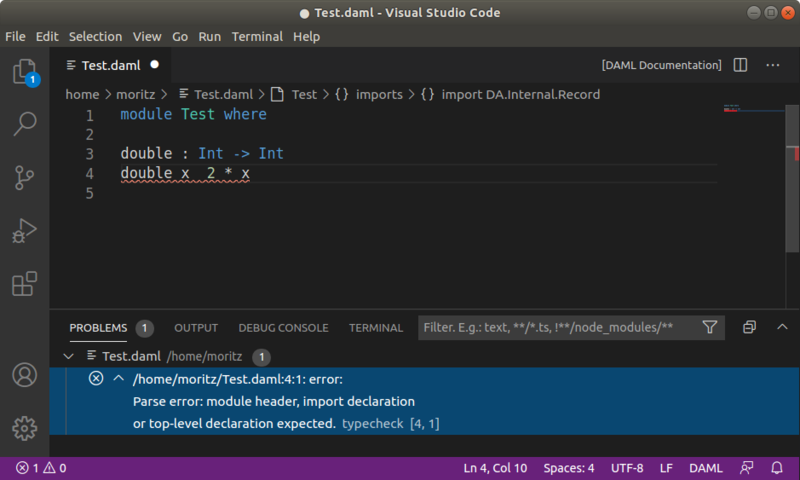 Check that the DAML Studio extension is installed by first clicking on the Extensions icon at the bottom of the VS Code sidebar, and then clicking on the DAML Studio extension that should be listed on the pane. Open a new file (⌘N) and save it (⌘S) as Test.daml. -- Copyright (c) 2019 Digital Asset (Switzerland) GmbH and/or its affiliates. All rights reserved. Your screen should now look like the image below. Introduce a parse error by deleting the = sign and then clicking the Ⓧ symbol on the lower-left corner. Your screen should now look like the image below. Remove the parse error by restoring the = sign. We recommend reviewing the Visual Studio Code documentation to learn more about how to use it. To learn more about DAML, see DAML reference docs. Visual Studio Code provides many helpful features for editing DAML files and Digital Asset recommends reviewing Visual Studio Code Basics and Visual Studio Code Keyboard Shortcuts for OS X. The DAML Studio extension for Visual Studio Code provides the following DAML-specific features. Use the commands listed below to navigate between symbols, rename them, and inspect any problems detected in your DAML files. Symbols are identifiers such as template names, lambda arguments, variables, and so on. You can also start a command by typing its name into the command palette (press ⇧⌘P or F1). The command palette is also handy for looking up keyboard shortcuts. You can hover over most symbols in the code to display additional information such as its type. Top-level declarations of type Scenario are decorated with a Scenario results code lens. You can click on the Scenario results code lens to inspect the transaction graph or an error resulting from running that scenario. The scenario results present a simplified view of a ledger, in the form of a transaction graph, after execution of the scenario. The transaction graph consists of transactions, each of which contain one or more updates to the ledger, that is creates and exercises. The transaction graph also records fetches of contracts. The result of the first scenario transaction #0 was the creation of the Iou contract with the arguments bank, 10, and "USD". The created contract is referenced in transaction #1, step 0. The created contract was consumed in transaction #1, step 0. A new contract was created in transaction #1, step 1, and has been divulged to parties ‘Alice’, ‘Bob’, and ‘Bank’. At the end of the scenario only the contract created in #1:1 remains. The return value from running the scenario is the contract identifier #1:1. And finally, the contract identifiers assigned in scenario execution correspond to the scenario step that created them (e.g. #1). You can navigate to the corresponding source code by clicking on the location shown in parenthesis (e.g. Iou:20:12, which means the Iou module, line 20 and column 1). You can also navigate between transactions by clicking on the transaction and contract ids (e.g. #1:0). You can automatically complete a number of “snippets” when editing a DAML source file. By default, hitting ^-Space after typing a DAML keyword displays available snippets that you can insert. With those changes in place, you can simply hit Tab after a keyword to insert the code pattern. You can develop your own snippets by following the instructions in Creating your own Snippets to create an appropriate daml.json snippet file. During DAML execution, errors can occur due to exceptions (e.g. use of “abort”, or division by zero), or due to authorization failures. You can expect to run into the following errors when writing DAML. A link to the last source code location encountered before the error occurred. The variables that are in scope when the error occurred. Note that contract identifiers are links that lead you to the transaction in which the contract was created. The ledger time at which the error occurred. Call stack shows the function calls leading to the failing function. Updates and scenarios that do not take parameters are not included in the call stack. The transaction that is being constructed, but not yet committed to the ledger. Transactions that were successfully committed to the ledger prior to the error. To create the “Example” contract one would need to bring both parties to authorize the creation via a choice, for example ‘Alice’ could create a contract giving ‘Bob’ the choice to create the ‘Example’ contract. Similarly to creates, exercises can also fail due to missing authorizations when a party that is not a controller of a choice exercises it. From the error we can see that the parties authorizing the exercise (‘Bob’) is not a subset of the required controlling parties. Attempt to fetch or exercise a contract not visible to the committer. To fix this issue the party ‘Bob’ should be made a controlling party in one of the choices.